The start of this year's Blaugust fell slightly awkwardly for me. Usually I post on days when I'm not working. Sometimes I'll post in the evening after work, if I've got the following day off . Occasionally, if there's a breaking news story I want to leech off talk about, I might post on a work night but mostly I go quiet midweek. This first of August was a Wednesday. Most months I only get one Wednesday off and this wasn't one of them. In fact, this week had me working Tuesday through Friday, which is about as inconvenient as it could have been, given I was supposed to be posting every day. Fortunately, although the days were bad, I had a bit of luck with the hours. Mostly I tend to start work latish, around ten, but someone was on holiday and I got his shift for the week, which meant starting at 8.30 a.m.. That gave me an uninterrupted five hours or so after I'd come home and had my tea . Even then, time was tight. Three accounts doing GW2 dailies (including Krait) and one account also doing the dailies for Festival of the Four Winds does tend to eat up a fair amount of your evening. Not to mention the weather's been beautiful and Mrs Bhagpuss and I like to go for a walk around sunset. 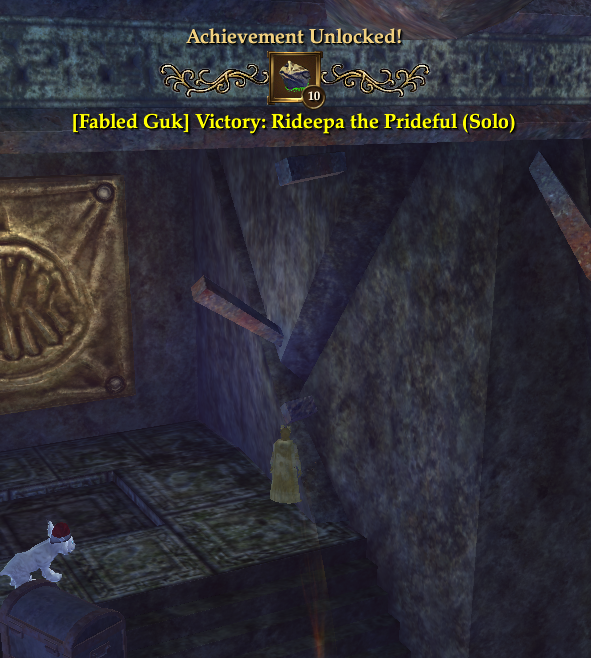 And as if that wasn't enough, Tuesday just had to be the day Daybreak decided to drop a really interesting update for EQ2. Return to Guk came somewhat out of the blue for me but the moment I saw there were Fabled versions of Halls of the Fallen and Lower Corridors you could solo I was right there! Well, sort of. A bit. What with all those dailies and holiday events and blog posts, there's been precious little time to spare for dungeoneering. On Tuesday night I managed to find the way in to the new instances - a portal in Plane of Magic, just outside the Halls of Valor. It seems that DBG plan on developing that small island into some kind of one-stop shop for current content. The portal to the new Plane of Hate is there and of course the HoV instance itself is the gateway for all content in the last expansion. I'm not seeing the lore logic behind it, but as a pragmatic way of getting everyone where they need to be it's a major improvement on both Terrors of Thalumbra and Kunark Ascending, both of which were over-concerned with lore to the detriment of convenience. Tuesday, I just poked around the first few rooms to see how manageable it was. Fabled Dungeons can be tough. They're meant to be. The new solo method (very tough mobs, huge buff on player) seemed to be working nicely. I was AEing multiple groups of orange con triple-up frogs with no great risk to life or limb. Took a while but it was pitched about right. Curiosity temporarily sated, I logged out and didn't come back until Thursday. Personal instances last for three days so I zoned into the same one and ran through a few empty rooms until I bumped into a bunch of frogloks...who died. Instantly. So fast I hadn't even had time to attack them - my Mercenary, defending me, had killed them all before I even realized they were there. This happened several more times. I tried to pull orange-con Heroic mobs and they died when the first arrow hit them. Clearly something was wrong. I considered dropping the instance and restarting - it seemed like I might be exploiting if I carried on but in the end I thought, oh well, it's only one instance, lets see how it goes. The first Named (as we call Bosses in Norrath) died in about two hits. He dropped me a major upgrade. As I moved to the next Named, however, I was ganged by a bunch of frogs who seemed to have eaten their spinach. They were properly tough, as they had been on the opening night. I dispatched them and pulled the second Named. He seemed to have about a gazillion hit points. He also summoned plenty of tough adds. I ran flat out of power when he was just under half health. For once, I remembered I could pop a power potion, so I did. It just about lasted me 'til he dropped. It seemed like a fair fight and I got another very nice upgrade off him. So far, so profitable. It was getting too late to try for the third Named but I went a little further and lo and behold some more tissue-paper frogs tried their luck and died in one round of AEs. I'm guessing I have a bugged instance - bugged in my favor - but it will have expired by... well, right about now in fact. One short run when you're not really sure what's going on doesn't point to "Exploit" on my moral compass so I'll be keeping the goodies. I have tomorrow free so I should be able to experiment some more and also blog about it. Or about something else. If I happen to have thought of something else, that is. As you can see, when I don't have anything in mind and no time to write about it even if I did, I just start writing about what I've been doing and let whatever happens happen.